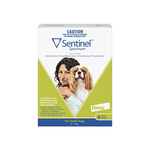 Why buy Sentinel Spectrum for Dogs? 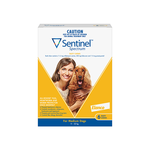 Dog Sentinel is one of the most popular and trusted flea and worming brands on the market. 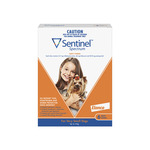 Sentinel is a complete flea and wormer for dogs and is easy to give as it comes in a tasty chew. What does Sentinel cover? All common year-long parasites are covered for with sentinel, including fleas, heartworm, and intestinal worms such as hookworm, whipworm, roundworm and tapeworm. Sentinel has no coverage for ticks. Sentinel is available as Sentinel Brown for very small dogs weighing under 4kg, Sentinel Green for small dogs weighing 4-11kg, Sentinel Yellow for medium dogs weighing 11-20kg, and Sentinel Blue for Large dogs weighing 22-45kg. 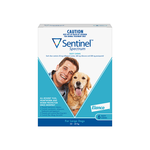 Sentinel has been used for years and is trusted by veterinarians worldwide. It's active ingredients are milbemycin and praziquantel for worm protection, and lufenuron for flea protection. Pet Circle has competitive prices to ensure we sell top quality parasite prevention like dog Seresto at the cheapest price possible.